Q: This is your first book. What inspired you to write Flavors of Life? A: The idea for Flavors of Life can be traced to one sunny afternoon in August, 2012. While exploring Amsterdam, I discovered a Caribbean restaurant. It got us thinking, surfacing several unanswered questions. What makes a Caribbean restaurant, a Caribbean restaurant? What kind of food do they serve? Who is the owner? Is the owner from a country in the Caribbean or just a fan? Why did they open this restaurant in Amsterdam, of all places? These thoughts led us to another realization, reflecting on just how international Amsterdam really is. We heard the statistics outlining how many nationalities call Amsterdam home (178), however, it wasn’t until we looked closer that we saw how diversity has impacted the restaurant scene. Furthermore, I knew why I moved to Amsterdam, but it made me curious why everyone else chose this small, yet beautiful and open-minded city. For a while, I had been tinkering with a few different book ideas, but for one reason or another they just weren’t feasible at the time. When we stumbled upon this Caribbean restaurant, it resonated with me that many others experienced similar dreams. Additionally, we as a society often read reviews, newspaper articles, and Blog posts about the restaurants, specifically detailing quality of the food, friendliness and promptness of the service, and cleanliness of the establishment, yet what is often forgotten is the person who created the experience: the owner. From a young age, I have been captivated by good stories. I love meeting people and hearing about their life. Combined with my journalistic background and interest in writing human-interest pieces, not to mention my love for fabulous food, I decided to interview international restaurant owners, digging into their history – from childhood to present day – to discover exactly how they got involved in the restaurant industry, as well as how they ended up in Amsterdam. Q: The detail in Flavors of Life is remarkable. Tell us about the process you went through to write this book. Did you conduct interviews with each of the owners? How many hours a day did you devote to writing? What type of schedule did you follow? A: In October 2013, after researching and outlining the concept over the summer, I made the decision to move forward, transforming my idea into a reality. I spent about a month deciding which restaurants to interview, looking at a variety of factors including but not limited to cuisine, nationality, and background story if known. I conducted interviews in person with all of the restaurant owners, taking the time to get to know them and their story. I recorded all of the interviews, transcribed the audio files, and used those notes as the foundation for writing the book. The interview and transcription process lasted about seven months. Writing came next, followed by the first round of edits. I then met with all the owners once more to collect photographs and receive feedback on the first draft. Once all the materials were in order, I started designing the book and working with my second and third editors to ensure my work was succinct, clear, and polished. Once all the feedback was incorporated, I met with my owners for a final time to show them the end product. My schedule consisted of long days. When I was not out meeting with one of my restaurant owners, I was at home writing, editing, designing, or doing something else book related. I worked seven days a week, sometimes working as many as 10 or 11 hours a day. I was dedicated to publishing the best product possible. Q: Share one or two of your favorite quotes from Flavors of Life. Why do they stand out to you? A: Two quotes in particular stand out to me. The first is from Surya Raj Giri, a Nepalese man who is the owner of Himalayan Kitchen. He said, “If you do not learn something new from the new community, then why do you go there?” I can relate to this quote on multiple levels. An expat myself, I think there is great value in immersing yourself in your new culture. Learning the ways of the country helps you adapt to the new living situation and makes the transition easier. Of course I still feel it is important to hold onto your own values and traditions, but learning from the new community will help you adapt and feel at home. Plus, every day I believe you should learn something new, so why not take advantage of your situation. All of the owners in my book come from other countries, and all of them made the brave leap abroad. Another quote that resonates with me is from Toufik Belaid, an Algerian man who owned Restaurant Algiers. In describing his country, culture, and youth, he explained, “We don’t eat to live. We live to eat.” Food is important for numerous reasons. The ingredients communicate information about the society and its history. On a fundamental level it shows what is needed to sustain life in a certain part of the world. Not only that, local specialties indicate what’s in season, availability of certain goods, preferences, as well as how old traditions have been incorporated into modern day times. Flavors illustrate the passion and creativity of a community attempting to colorfully combine ingredients and spices to produce a tasty and nourishing end result. From a social perspective, the first question often posed in many countries is, “what would you like to eat?” rather than, “what would you like to drink?” Food is more than just sustenance. For many families around the world, offering food is a way to show hospitality, even if they do not have much to share. It is about winning love through the stomach and bringing people together. Just like Toufik, I savor every bite, whether it’s a comfort food classic or trying a new cuisine; I live to eat. 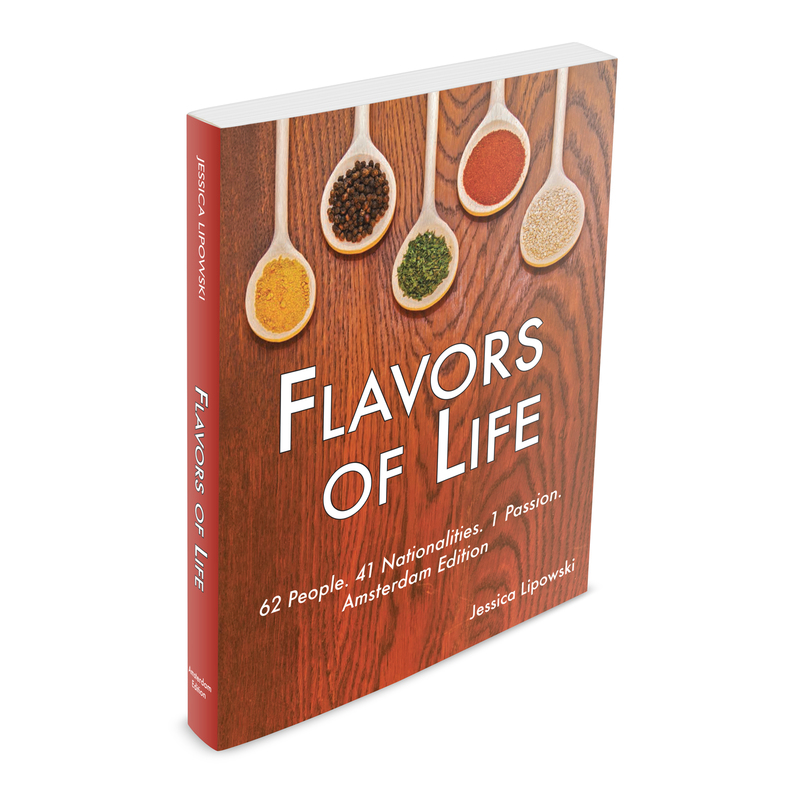 Q: Can you personally relate to any of the restaurateurs or their circumstances contained in Flavors of Life? Please share an example or two. A: While I was interviewing the restaurateurs, several stories shared about adjusting to a new life in the Netherlands resonated with me. As an expat, I also faced many challenges when I first moved; for instance learning a new language or figuring out how to assimilate to Dutch culture. Additionally, I could directly relate with those people that moved abroad in search of a new adventure, as that is exactly what I wanted, too. However, there are two instances in particular that stand out to me. Anna Kelhu, co-owner of A Piece of Finland, said she didn’t leave Finland because she wanted out, but because the rest of the world was calling her, drawing her in. That is how I felt about moving to the Netherlands. It wasn’t that I needed to leave the United States, but I felt this urge, this desire, to see and experience the world. Noah Tucker, co-owner of Staring at Jacob, Eastside Amsterdam, and Thirty5ive Wine Bar, once said to me that he felt life was all about experience. He does not want to miss out on any opportunity. I share these sentiments, living everyday to the fullest. The motto “Carpe Diem” or “Seize The Day” is one of the reasons I set out to publish a book and fulfill a long-time dream of mine. Q: What have you learned from writing this book? How do you plan to apply that to your future endeavors? A: Working on this book has opened my eyes to new and different perspectives. I met and interacted with people from every corner of the world. Additionally, communicating and collaborating with approximately 70 to 80 people sharpened my people skills. The interviews and stories remind me that life is precious, teaching me to value every single moment with the ones I love. Even with unexpected curveballs and setbacks, life is truly beautiful. It has made me appreciate how fortunate and privileged I truly am with all the opportunities I’ve been presented, such as traveling (from a baby ‘til now) and the ability to follow my dreams. Not everyone has this chance. Writing the book confirms that I have the courage to achieve anything to which I set my mind. Many of the owners started with nothing and worked hard to become successful entrepreneurs. I spent a couple of years working on this project, enduring long hours, numerous obstacles, and setbacks. Sustaining ourselves on one income forced us to re-evaluate priorities. This book is one of my greatest achievements to date, and it would not have been possible without persistence and dedication. As this was my first book, I also acquired an array of knowledge about how to write, publish, and market a book. Q: What mark are you hoping this book will leave on the world? Do you feel this book is timeless? A: I do believe Flavors of Life is a timeless book. On a fundamental level, the book illustrates that people around the world are the same; no matter where they come from, no matter where they were raised, regardless of religion, customs, or other beliefs. In general we share the same emotions, stresses, and joys. We all want to do well. We simply want to live, laugh, and love. It is part of being human, no matter from which country we come. Additionally, food and the customs surrounding it also unite us, from a simple meal on a Wednesday evening with the immediate family, to an elaborate feast on holidays, such as Christmas, Eid al-Adha, and the New Year. Wherever you are in the world, food can bring you home. Food and family are two timeless values that permeate throughout society in every culture, past, present, and future. While the book looks at restaurant owners in Amsterdam, the similar ideals and types of stories can be transferred and applied on a broader level. In a way, we are all tied together by the same threads. Our stories create a world recipe. Q: You left the corporate world in April 2013. Tell us about your decision to break out on your own. What inspired you to make this move? Were you excited/nervous? A: From 2010 to 2013, I branched away from the Journalism world and moved into a different line of work: project management and sales and marketing. Many of the skills I developed in Journalism school and my internships were still applicable, including my work ethic, time management, and ability to communicate clearly. As time went on, I realized how much I missed writing. In 2012, I started working as a freelance writer for 10Best.com, now part of USAToday. Writing about Amsterdam surfaced a bubbling question: should I go back to my passion, writing? The answer? Yes. In April 2013, I left my company to break out on my own and continue writing for USAToday. In September 2013, together my partner, I made a bold decision to focus on a life-long goal: write a book. I experienced many emotions. I was excited to start this project, but nervous at the same time, wondering what would happen if it didn’t work out? Working on this project also meant that we would be on one income. We made the bold leap to follow our dreams, and our hard work has paid off. Q: What comes next? Are you hoping to write another book? Or do you see yourself going back to a full-time job? A: What comes next? That’s a good question. Depending on how everything pans out, I am potentially interested in publishing another book. I have a few ideas in mind, but would like to develop them further before publicly commenting on the concepts. Additionally, I love the city of Amsterdam and have considered doing tours. Regardless, writing will continue to be a part of my life. If you have more questions for Jessica, please do not hesitate to contact her.